I wish you the best in your effort to regain positive dynamics, but I beg you, please don't let your government carry out its main agenda: the suicidal revival of your great country's darkest moments. Shinzo Abe is an outspoken revisionist and negationist who pledged to rewrite Japan's peace constitution, and to obliterate all records of Imperial Japan's war crimes. Shinzo Abe, who headed the Japaneses Society for History Textbook Reform, denies all universally recognized atrocities, from the Nankin massacre to sexual slavery (midly dubbed "comfort women"), and now even dares questioning the use of "invasion" to qualify that doomed regime's expansionism. Shinzo Abe insists on visiting Yasukuni Shrine, a place Emperor Hirohito himself refused to visit ever since it was made public that the remains of war criminals had been moved there, the place where Japanese die-hard fascists chose to invite all European extreme-right leaders in an infamous field trip. Shinzo Abe, who represents Japan and speaks in its name, refuses to consider war criminals as criminals, imperialists as imperialists, and Japan as a peaceful country. And if you think this man is not a fascist, what more do you need? The return of the "kill all, loot all, destroy all" policy? His portrait between that of Adolf and Benito? 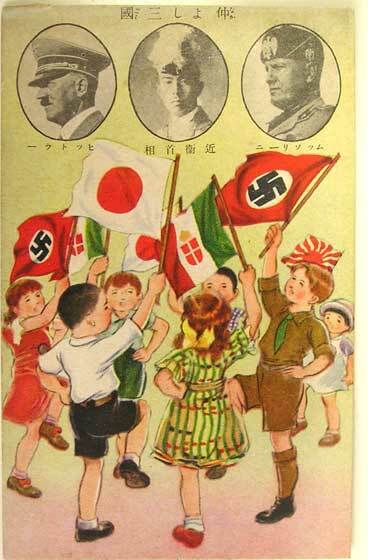 PM Fumimaro Konoe between Adolf Hitler and Benito Mussolini. These images will only belong to the past when Japan sets the record clear about the Imperial regime that disgraced it decades ago. PS: I didn't reach the Godwin point, Abe did. Imagine a German Chancelor saying what he said: they'd be impeached and face justice for such an ignominy. The worst enemies are always the ones from within and right now, Shinzo Abe and the ultra-nationalist bureaucracy that corrupted Japan's entire political system are the worst enemies of Japan. They deliberately fuel mutual hatred across the region because they need other hatemongers to reach power to secure their own future. For the moment, they're not only alienating Korea, Japan, and America, but bringing friends of Japan closer together to denounce their imposture. You think they are irrelevant and that's true, but they are dangerous, and they want to reshape Japan into a nation where people like them are relevant. You think politics have nothing to do with you but it has to do with everything you do, and in order to survive as a democracy, you simply must reclaim it, and keep people like them away from politics. If you love your country, act as true Japanese citizens, speak up, say no to Abeignomics, and reject as false the choice between revisionism and nationalism. - "We reject as false the choice between revisionism and nationalism - for a Global Truth and Reconciliation Network"
- "Japan politics? No to Comfort women, yes to Political whoring"
- "Ad Nauseam: about Dark Tourism, the Blind Spots of Memory, and Free Thrashing Agreements"
- "Tokyo Sakura With Patriot Missiles (A Still Life)"
- "One Thousand Wednesdays" (also on my blogules blog in English "1,000th week of shame for Japan" and in French "Japon: regarde-toi, le monde te regarde" "also on Rue89"A Séoul, les « femmes de réconfort » de l'armée japonaise réclament justice"
- "Revisionist schoolbooks : change has not come to Japan"
- "Claiming Dokdo as Takeshima equals claiming Seoul as Gyeongseong"
For people like me who grew up during the 1970s-1980s, Margaret Thatcher was an outstanding marker in politics: preceded and succeded by nobodies at home, she saw the USSR shift from Leonid Brezhnev to Michail Gorbachev, the USA shift from Jimmy Carter to Ronald Reagan (nevermind 41), the Germanies of Helmut Schmidt and Erich Honecker shift to Helmut Kohl's reunited Germany, France shift from Valery Giscard d'Estaing to Francois Mitterrand, the Vatican shift from Paul VI to John Paul II, South Korea shift from PARK Chung-hee to ROH Tae-woo, and North Korea shift from KIM Il-sung to KIM Il-sung. She even outruled by a few months her old friend Augusto Pinochet. CNN's weird choice of a background picture to announce the passing of Margaret Thatcher: with the now infamous Jimmy Saville. Thaville and Satcher? 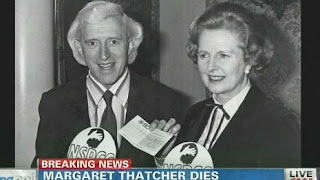 Note that it could have been even worse for the Iron Lady: a picture of her with Ronald Reagan. Margaret Thatcher embodied at the same time the United Kingdom and its very negation, always the present or the past, never the future. In many ways, she was a caricatural leader, sharing traits with statesmen she didn't share many ideas with. So who resembles most Margaret Thatcher as a leader? Certainly not Angela Merkel or Julia Gillard, who've done little more than winning against Gerhard Schroeder and Kevin Rudd, and then benefiting from their reforms. I'd rather look in the supposedly opposite direction. Why not Hugo Chavez? Both he and Thatcher revived a nation by stubbornly replacing obsolete ideologies with obsolete ideologies.